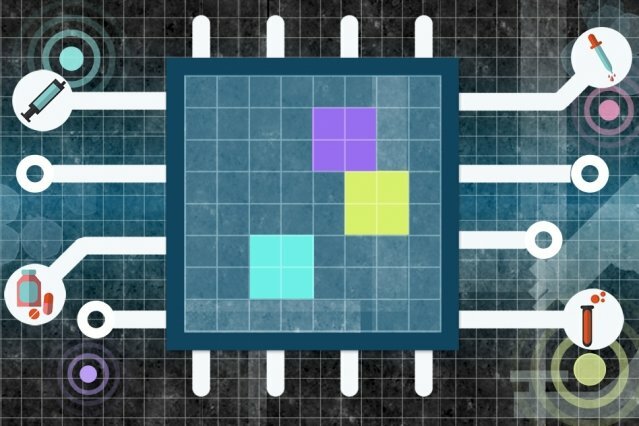 In a paper being presented next week at the 2018 Machine Learning for Healthcare conference at Stanford University, MIT Media Lab researchers detail a model that could make dosing regimens less toxic but still effective. Powered by a "self-learning" machine-learning technique, the model looks at treatment regimens currently in use, and iteratively adjusts the doses. Eventually, it finds an optimal treatment plan, with the lowest possible potency and frequency of doses that should still reduce tumor sizes to a degree comparable to that of traditional regimens. "We kept the goal, where we have to help patients by reducing tumor sizes but, at the same time, we want to make sure the quality of life—the dosing toxicity—doesn't lead to overwhelming sickness and harmful side effects," says Pratik Shah, a principal investigator at the Media Lab who supervised this research. The paper's first author is Media Lab researcher Gregory Yauney. The researchers' model uses a technique called reinforced learning (RL), a method inspired by behavioral psychology, in which a model learns to favor certain behavior that leads to a desired outcome. The technique comprises artificially intelligent "agents" that complete "actions" in an unpredictable, complex environment to reach a desired "outcome." Whenever it completes an action, the agent receives a "reward" or "penalty," depending on whether the action works toward the outcome. Then, the agent adjusts its actions accordingly to achieve that outcome. The approach was used to train the computer program DeepMind that in 2016 made headlines for beating one of the world's best human players in the game "Go." It's also used to train driverless cars in maneuvers, such as merging into traffic or parking, where the vehicle will practice over and over, adjusting its course, until it gets it right. The model's agent combs through traditionally administered regimens. These regimens are based on protocols that have been used clinically for decades and are based on animal testing and various clinical trials. Oncologists use these established protocols to predict how much doses to give patients based on weight. As the model explores the regimen, at each planned dosing interval—say, once a month—it decides on one of several actions. It can, first, either initiate or withhold a dose. If it does administer, it then decides if the entire dose, or only a portion, is necessary. At each action, it pings another clinical model—often used to predict a tumor's change in size in response to treatments—to see if the action shrinks the mean tumor diameter. If it does, the model receives a reward. However, the researchers also had to make sure the model doesn't just dish out a maximum number and potency of doses. Whenever the model chooses to administer all full doses, therefore, it gets penalized, so instead chooses fewer, smaller doses. "If all we want to do is reduce the mean tumor diameter, and let it take whatever actions it wants, it will administer drugs irresponsibly," Shah says. "Instead, we said, 'We need to reduce the harmful actions it takes to get to that outcome.'" This represents an "unorthodox RL model, described in the paper for the first time," Shah says, that weighs potential negative consequences of actions (doses) against an outcome (tumor reduction). Traditional RL models work toward a single outcome, such as winning a game, and take any and all actions that maximize that outcome. On the other hand, the researchers' model, at each action, has flexibility to find a dose that doesn't necessarily solely maximize tumor reduction, but that strikes a perfect balance between maximum tumor reduction and low toxicity. This technique, he adds, has various medical and clinical trial applications, where actions for treating patients must be regulated to prevent harmful side effects. The researchers then tested the model on 50 new simulated patients and compared the results to those of a conventional regimen using both TMZ and PVC. When given no dosage penalty, the model designed nearly identical regimens to human experts. Given small and large dosing penalties, however, it substantially cut the doses' frequency and potency, while reducing tumor sizes. "We said [to the model], 'Do you have to administer the same dose for all the patients? And it said, 'No. I can give a quarter dose to this person, half to this person, and maybe we skip a dose for this person.' That was the most exciting part of this work, where we are able to generate precision medicine-based treatments by conducting one-person trials using unorthodox machine-learning architectures," Shah says.